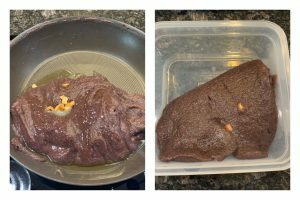 Kavuni arisi halwa/ Black rice halwa is a delicious and flavorful halwa originating from chettinadu cuisine. Black rice halwa as the name goes it is made with black rice called kavuni arisi in tamil and coconut milk. What coconut milk? Yes you heard that right, this particular ingredient adds more taste to the unique flavors of black rice. 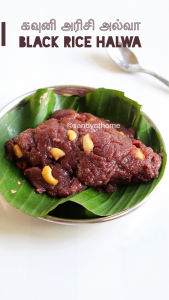 Chettinadu cooking always stands out for its ingredients, making and dishes too and this halwa/ dish is no exception. 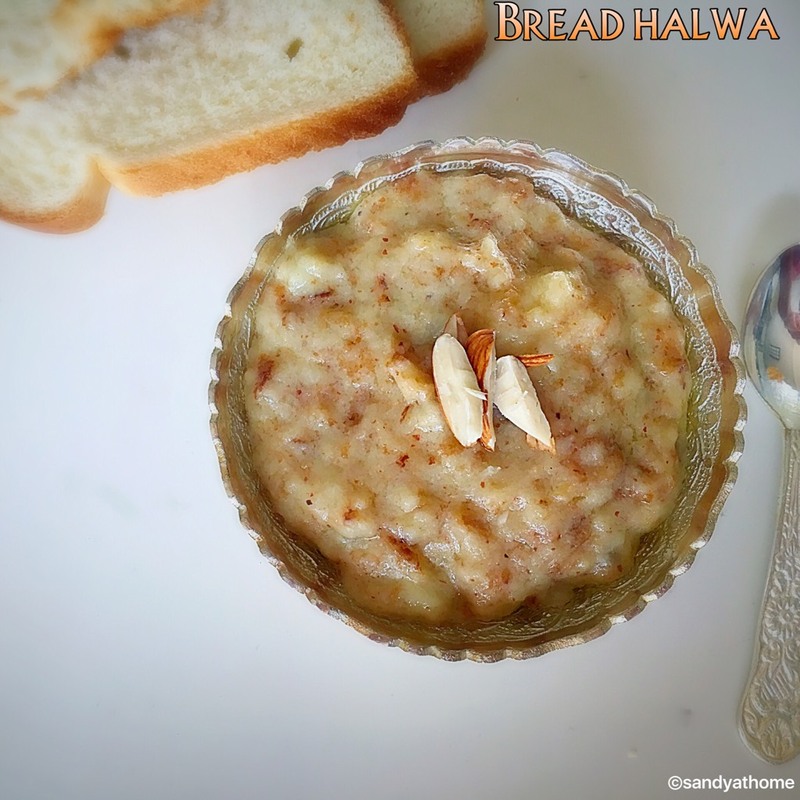 This halwa takes very less time to make but the result is yields is unmatchable. For this recipe using homemade coconut milk yields better taste and flavors, so I used homemade coconut milk only. So where do we get this black rice/ black rice flour? Its found in all the stores of India, I am not sure about its availability in other foreign countries but I have never seen this particular rice here in US. So I wanted try making this halwa for the longest like since 2 years, so called one of closest friend to send this rice through courier. But this particular rice variety couldn’t be sent through courier and few others dint even understand what I was asking for. So I started searching in all the Indian stores here and kept pestering few well known store people at Indian store. So after 2 years of constant hunt and I finally found 2 packets of black rice flour. 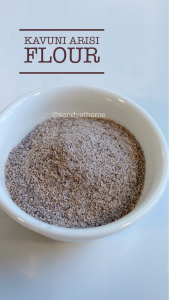 First I was not convinced to buy as I want the rice itself, later I decided why not try recipes with the flour itself as I really wanted those recipes to be in the blog and most importantly I wanted to taste it as well😂. So all the struggle paid me off today because this halwa tastes super good. 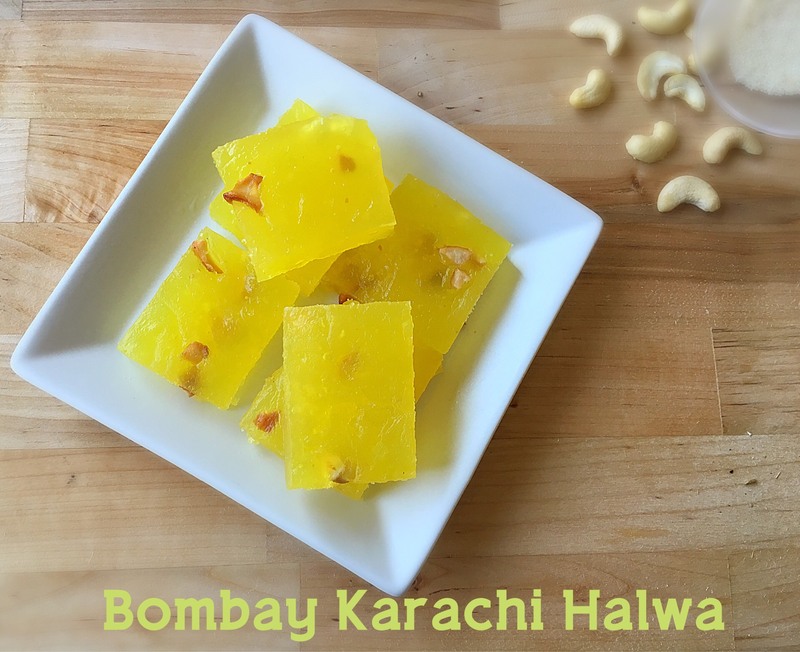 Try this halwa recipe for this diwali or for any other festival and I am sure you will like it too! So lets get to the making! In a blender add ½ grated coconut/ coconut pieces and 1 cup water. Grind it well. Now place a strainer over a bowl and strain the coconut milk by pressing the coconut mixture with a spoon. Keep this milk aside. 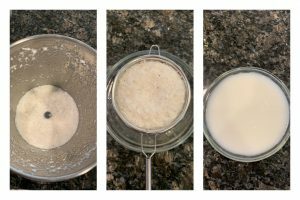 we are going to add water to the milk later and don’t worry if the coconut milk is not thick as we want thin coconut milk as we need to cook it. 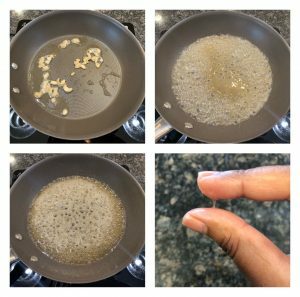 Heat 2 tsp ghee in a pan, fry cashews until golden brown. When done remove it. In a pan add sugar and water and allow the sugar to dissolve on medium flame. Reduce flame to low, allow the sugar syrup to thicken lightly. The syrup should be sticky on touch and it should reach one string consistency. as shown in the picture. When the sugar syrup is ready add the rice water mixture to it. Keep the flame in low to medium and keep stirring continuously. 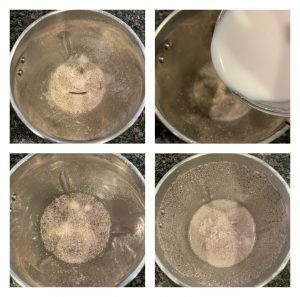 If you stop stirring the mixture will form lumps. 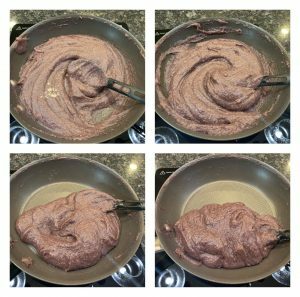 Keep stirring and after 5 minutes you will see the halwa thickening. 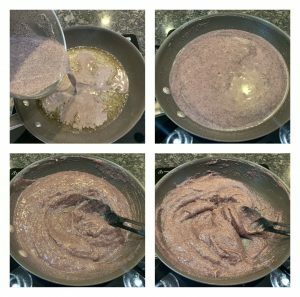 When the halwa is still gooey thick like porridge add cardamom powder and keep stirring it well. Slowly after 8 to 9 minutes the halwa will start leaving the pan. Now that the halwa is almost ready add the remaining ghee and the fried cashews and mix well. Yummy and flavorful halwa ready to be served! Transfer it to a container and enjoy!